Responding to the outrage at his ignoring the soldiers killed in Niger and their grieving families for a week and a half and his unsympathetic call following that, Donald Trump announced his solution to this issue. Trump has ordered his Communications Director, Hope Hicks, to set up a robocall system that will automatically dial the families of soldiers who have been killed within hours of the confirmation of their deaths. TRUMP: Hello, this is President Donald Trump, president of the United States and the Virgin Islands I’m told. I’m calling because even though they knew what they signed up for, your son, daughter, husband, wife, father, mother, boyfriend or girlfriend was killed while serving in our military. I’m personally very upset about this. It’s really, really, really sad. Really sad. Sorry about that. Oh well. What ya gonna do? At least, I hope some of your sadness will go away because I robocalled you with my sincere feelings about the death of whatever your son’s, daughter’s, husband’s, wife’s or etcetera’s name was. 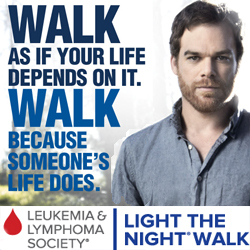 If so, it would be nice if you’d post on Facebook or Twitter or tell anyone in the media how great I’ve been about this. Also, there will be a survey after this call is over, I’d really appreciate your staying on the line and giving me a ten out of ten. After all, making this robocall to you is one of the most difficult things I have to do as president. No one appreciates how hard this is on me, no one suffers as much as I do in a situation like this. I mean, at least your relative or whatever died but I don’t even know who they are and I’m having to be put through this. And you’re not the first or the last robocall like this I have to make, you’re one of many calls so it’s over for you when I hang up but then I have to robocall someone else and if I don’t make sure that happens, of course I’ll be unfairly attacked again by the Fake News. And who’s gonna call me to comfort me? You? I don’t think so. 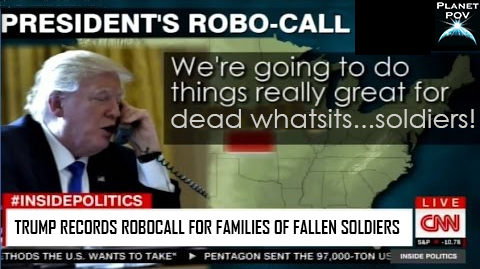 Trump boasted that with his new robocall system, he will be the most caring and responsive president in American history when it comes to consoling Gold Star families. “This system will be just beautiful. Everyone who has a family member killed, gets a call automatically from the president. It’s so great, I think more families will feel better about their kid getting killed, maybe even look forward to it knowing they’re guaranteed a call from me, the Comforter in Chief,” Trump beamed. Oh my Lord, this is brilliant, AdLib. Not softball, that’s for sure. I think ‘biting’ would be the word for this kind of satire — but exactly what’s called for. The only thing that could make it more “Trumpish” for be for him to decide that placing robo-calls is too labor intensive. He just might issue a presidential executive order stating that if Gold Star families want consolation from him they’ll need to call an 800 number. Is there any doubt that what they would hear would be: “Your call is very important to us. Please stay on the line for the next available operator. We are experiencing unusually heavy call volumes at this time and we appreciate your patience. Your wait time is anticipated to be 83 minutes… *pause* Your call is very important to us…”? Kes, that would be an even better choice for this sociopathic nutjob. Even making the call seems to be too much for him, he can’t be bothered to remember the soldier’s name for three minutes. He might as well just use robots because at least you can program them to pretend to exude some empathy and human reaction. My British accent Siri guy sounds really friendly and interested in helping me. Unfortunately John Kelly must have been programmed by trump himself, and according to Huckabee Sanders, you don’t have the right to question a 4 Star general even if his “facts” are totally false. The Om Shinrikyo responsible for murders and the sarin attacks in 95’, were all made to wear hats connected to wires as they were indoctrinated to the fake cult and drugged up to their eyeballs to accept the nonsensical propaganda rubbish of their leader, Asahara. I’m beginning to believe that something similar must be happening in this WH. A cult remains a cult wherever it might be inflicting it’s delusional doctrine. But who could be warped enough to think that working for this WH and the cult of trumpism, could ever be thought of as being prestigious or in any way beneficial? Certainly no one who is completely sane. I consider the “cult of trumpism” to be akin to domestic terrorism as they try to destroy democracy and the government as we know it with the help of a foreign power. In any other country, that would be treason. Kalima, you’ve put your finger on it, Trump followers do exhibit the traits of cult followers. Only believing what the leader says, blind support of anything he says, attacking and discounting anyone who isn’t as slavishly devoted to the leader and his dogma, etc. They are impervious to reality and facts, their need to follow an authoritarian leader simplifies the complexities of life and they shut out anything that threatens to interfere with this small minded view of things. Maybe some could be de-programmed but my advice to the Dems is to write off these Trump Zombies, their brains have already been eaten. Focus on energizing the base and indies to come out next year to put the brakes on Trump’s unchecked power.